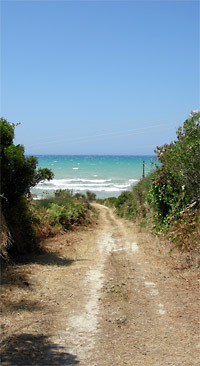 Dolphin-Camping is situated in a beautiful olive grove, with plenty of shade, five minutes walk from the sea. Surrounded by lovely, peaceful countryside, the camping grounds formerly belonged to a small monastery which was built on a hilltop between the campsite and the sea. The campsite itself is planted with age-old giant olive trees and other fruit trees, oleanders, roses and flowering bushes. Although it is not touristy, it is still within walking distance of the busy seaside resort of Sidari, where there are discotheques, karaoke bars, shops and an enormous choice of restaurants. The owner of the campsite, Babis, and his family give everyone a warm welcome, they are very friendly and helpful whenever you have a problem. On arrival, they show you around the place and leave it up to you to choose the place you like. The campsite is open for everybody; campers on bicycles, young people with rucksacks, families with bungalow tents, campervans or caravans. Additionally, the campsite offers a wide range of facilities like fridges, washing machines, a place for ironing, safe deposit boxes and access to the Internet. At your request the owner will also arrange car, scooter or bicycle rental for you. In short, the campsite offers you everything you need for an interesting and pleasant holiday. New! - Free Internet Hot Spot Available! The campsite is open between 01/05 until 31/10. Number of places: 70. Surface: 0,9 ha. This site has been made by friends of Dolphin-Camping who fell in love with this beautiful campsite. Click on: environment to read information in many European languages about tourist attractions on the island nearby the campsite.